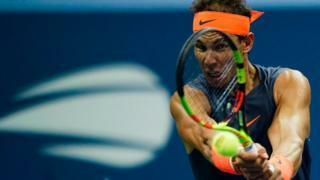 Tennis fans see correct match between Rafael Nadal and Dominic Thiem for US Open wey last from Tuesday night finish 2:03am local time Wednesday morning. World number one Nadal lose di opening set of im quarter-final match 6-0 after Thiem start well but di Spanish player bounce back to win 0-6 6-4 7-5 6-7 (4-7) 7-6 (7-5) for match wey last four hours and 49 minutes. Di 17-time Grand Slam champion go play world number three seed Juan Martin del Potro, di 2009 champion on Friday for semi-finals. Wetin Serena Williams go wear afta catsuit? Make we chook eye see tennis match dem wey long well-well. Di first round match between American John Isner and Frenchman Nicolas Mahut last for three days and dem play for 11 hours and five minutes. Di fifth set finish 70-68 wey make am di longest match for Wimbledon history and Isner win. Anderson wey from South African win di match 7-6 (8-6) 6-7 (5-7) 6-7 (9-11) 6-4 26-24. to reach di men's final. E take Fabrice Santoro 6 hours and 33 minutes to beat Arnaud Clement, for dia French Open match for 2010. Santoro bounce back afta im lose di first 3 points for di 30th game, to win di match. For 2012 Australia Open men's final, Novak Djokovic beat Rafael Nadal to defend im Australian Open title. Di match last five hours 53 minutes to make am di longest final for Grand Slam history, e finish 0137 local time. Paul-Henri Mathieu win John Isner for French Open marathon match 6-7 (2-7) 6-4 6-4 3-6 18-16. Di Frenchman win di match for five hours 41 minutes. US Open: Wetin Serena Williams go wear afta catsuit?